Chuck Stewart shot. When we were told to dress for the LP cover, Bob Shad said “dress like what you would think Jelly Bean Bandits look like.” Notice Jack on the right. He is wearing what ladies of the time called a cover-up when they went to the beach in their bathing suit. And notice that Jack’s guns are around his knees. 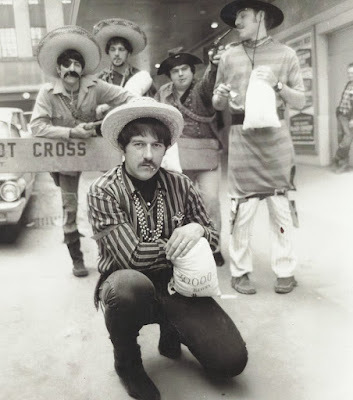 He took us out to Times Square in Manhattan 1967 to make these shots. Sure couldn’t do that nowadays. Interview with Michael Raab of The Jelly Bean Bandits. 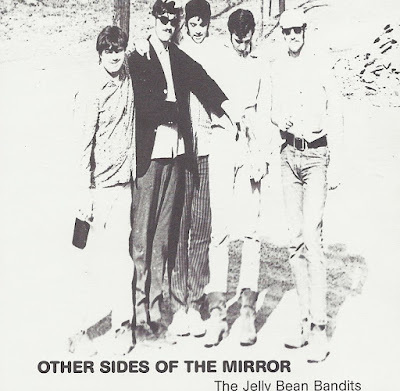 In 1968, The Jelly Bean Bandits put out their debut LP on Mainstream Records Inc. I grew up in a small town named Cornwall, 100 miles north of New York City, in the late 40s, 50s and early 60s. My father used to play music with a small local band playing big band music with a thump-tub. That was an inverted metal bath tub with a hole in its center. A piece of rope was run from the bottom side of the tub and had a knot in it so it didn’t slip through the hole. The piece of rope was attached to an upright stick around five foot tall. My father would pluck at the rope and depending on how tight or loose he pulled on the stick he was able to make simulated bass notes. My sister played bagpipes in a marching band. I wanted to join my high school band, but when I walked into them rehearsing, they were playing “Pomp and Circumstance.” I wanted to play Chuck Berry and Buddy Holly, so I turned around and walked out. 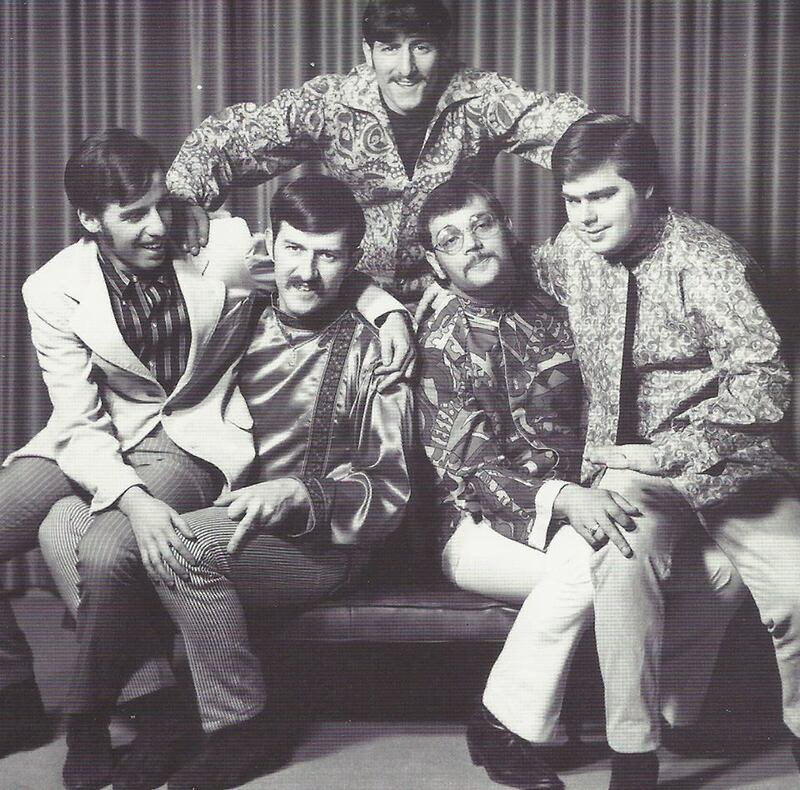 Our local music scene in the Hudson Valley (where Cornwall is located) was transitioning from oldies (like to aforementioned Chuck and Buddy) through a gap filled in by folks like Roy Orbison and almost to the Beatles era. A turbulent and exciting musical time. I started playing music on guitar when I was 19. Met a guy named Doug Shook, who knew 2 chords on a guitar. The kid upstairs from Doug’s apartment knew a few more chords and taught them to us. Doug’s brother Denny played drums so we started a band called The Furys. Like 10,000 other guitar players at the time, we cut our 6-string teeth on The Ventures.I eventually switched to keyboard because I wanted to work. There were 1,000 guitar players in the region, all better than me, but there were only like 3 keyboard players, so I bought a Farfisa and got down with it. 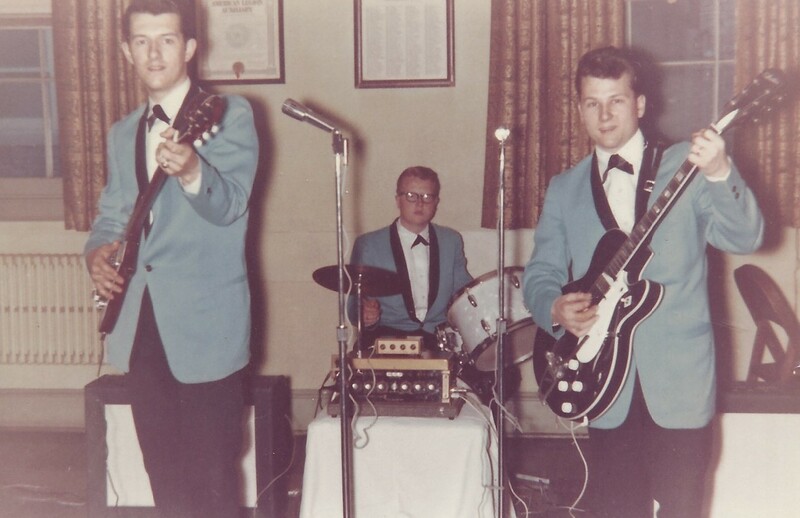 (The Furys, left to right) Michael Raab (rhythm guitar), Denny Shook (drums), Doug Shook (lead guitar). My very first band at our very first gig, 1962. Notice the matching Saxony jackets and the amazing (at the time) Guild Binson Echo-Rec. 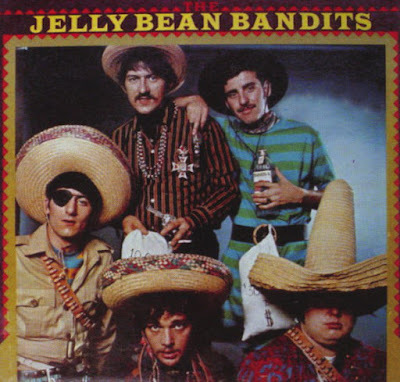 What bands were you a member of prior to the formation of The Jelly Bean Bandits? After the Furys I rambled through a number of groups. One was called The Aboriginies and Steve the lead singer never learned the complete lyrics to any song. He would start with the first verse that everyone knew, then make up other lyrics as he went along. Our rule of thumb at that time was to start together, end together and everything else in between would take care of itself somehow. Can you elaborate the formation of The Jelly Bean Bandits? I was in a band playing at the Mayflower nightclub, the roughest toughest bar in Newburgh New York at the time. Our drummer got so tired of running into fights in the mens room that he used the ladies room instead and no one complained. Our frontman, Billy Donald, was fresh out of the service and parking cars in the parking lot of another local nightclub, the Trade Winds. The house band at the time, The Goodtimes, would bring Billy in from the parking lot once a night to sing Roy Orbison on stage with them because his voice had that high range. We asked him to join the new group we were putting together. I had worked with Joe, our drummer, in The Aboriginies before. He was working behind a piano played doing weddings and was delighted to get back to rock and roll. Our lead guitarist Jack was working in a club across the street from the Mayflower and we asked him to join our group. We asked Fred to join us, but only if he gave up guitar and learned bass. He did. 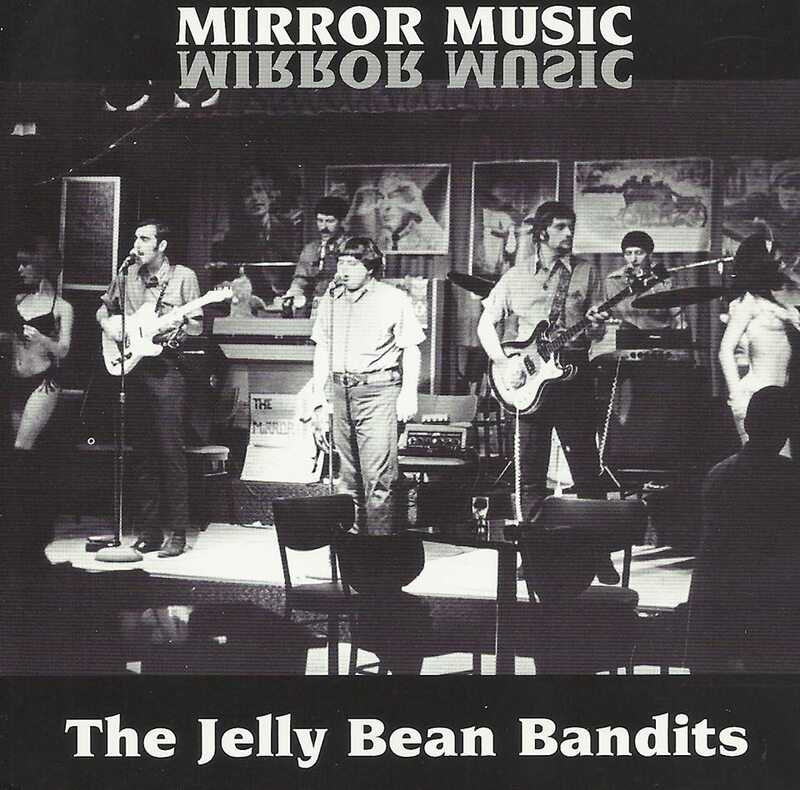 When and where did The Jelly Bean Bandits play their first gig? Do you remember the first song the band played? How was the band accepted by the audience? Our very first gig was at the Trade Winds nightclub in Newburgh, New York, a very classy nightclub. We were the weekend opening act. The house band that weekend was the Little Giants from New Jersey. They totally destroyed us and musically mopped the stage with us. They were that good and we were that bad. However, karma being what it is, a few years later when we were at our peak, we were the weekend house band at the Trade Winds and they were the weekend opening act for us. We chewed them up and spit them out. And it felt great. What sort of venues did The Jelly Bean Bandits play early on? Where were they located? We basically played 3 nightclubs – The Trade Winds, the Buccaneer in Poughkeepsie, New York, and the Red Dog in Burlington, Vermont. They were top 40 venues and we were the best cover band in 2 states. This however would create problems for the musical direction of the band. Our agent, Jimmy Lamare, was a great guy who kept us working, but never got us in clubs that accepted original material. We played a couple of others, but those three were basically it. How did you decide to use the name “The Jelly Bean Bandits”? Our original name was The Mirror. Turns out there were 2 other bands in the Hudson Valley with the same name. One night we went to another local club, the Coral Reef, and decided to get a new name. Gone were the days of one name bands, like The Ventures and The Shadows. Now it was like the Jefferson Airplane and Buffalo Springfield. Our personal favorite was The Peanut Butter Conspiracy. So after many drinks late at night, the Jelly Bean Bandits name somehow came up. Made perfect sense to us at the time so we kept it. Everything. We were fearless in our song selection. Nothing was untouchable. We went from “Purple Haze” to “MacArthur Park,” “On Broadway” to “Homburg”, “Expressway To Your Heart” and “Even The Bad Times Are Good.” Early in the 2000s we put out 2 live CDs from 1967 entitled “Mirror Music” and “Other Sides Of The Mirror”, the titles coming from our pre-Bandits name change. The variety was astounding. This is the second CD of music from 1967. Songs 1 through 10 were live performance. Songs 11-16 were the rough and raw basement tapes of us writing an albums worth of music in a few weeks. By the time the debut came out, we packed the houses as a powerhouse covering the top ten and then some. When our debut came out many of our club fans bought the LPs as mementos, but rarely asked for any of our original songs. We were the victims of a musical dichotomy as we would find out 34 years after the band broke up. We did a reunion concert in 2002 at the former Coliseum Restaurant in Newburgh and that is where we came face-to-face with our split personality. The people who packed the club were former fans of the live club band. When we played cover music like “Gimme Some Lovin” by Spencer Davis, they packed the dance floor. When we played Jelly Bean Bandits tunes, they sat down. They didn’t really know our original material in 1968. No station played it in the 34 years following that, so they really never knew those tunes at all. How did you get signed to Mainstream Records? We decided we wanted a recording. We assembled a demo tape of 3 tunes, went to Manhattan, went to a phone booth (remember them?) and ripped out the yellow pages listing record companies and began our assault on the record business. We got thrown out of every office we went into. We devised techniques like one of us would hold up the front desk secretary while the rest of us wandered through the hallways. Got thrown out much quicker. Then we landed at Mainstream. Met a pleasant secretary named Maxine who asked us to sit down and she would do what she could. Took our tape to the owner, Bob Shad, who listened and then called us into a meeting room. He asked us the question “What do you want? A recording contract?” Of course we said yes and he ushered us into the corporate lawyer Joe Diamond (his real name). We signed a three-LP deal. Later bios would inaccurately say that Mainstream dumped us after the first LP but the truth was the opposite. 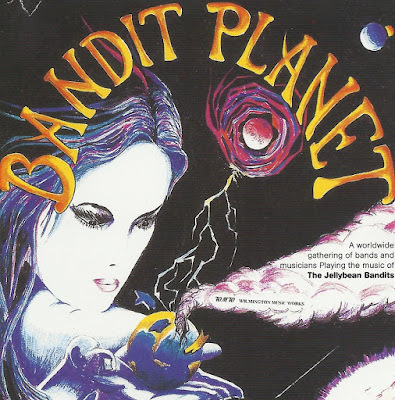 The Bandits self-destructed before we reached our second LP. We did have some songs ready for it, like “Salesman” and “Superhog” which turned up on our “Time and Again” 2001 CD in the “Bonus Collectors Section.” We signed a one-year management contract with Bob’s son-in-law Maury Apatow which turned out to be a bad judgement call by we the novices. He saw us perform once in that year and did nothing else. And if the name Apatow sounds familiar, his son Judd Apatow is the one who makes those mega-hit movies. Our return CD in 2001. Our musical styles had evolved but were still crossing all genres. Title song “Time and Again” was reviewed as “very much like Warren Zevon but with a little less bite.” “To Be Alone With You” was probably the finest country-style ballad we had ever done, with outstanding steel guitar work by Jack. And this is where we started getting into music videos. “Lover Wrapped In Leather” our rock & roll tribute to Mrs. Peel. Interesting group on Mainstream at the time. Big Brother & the Holding Company, with Janis Joplin, the Amboy Dukes with Ted Nugent … they were our label mates. Recorded it in Manhattan. Big studio that before we did our one and only session had a large 20+ orchestra recording in it and there was still lots of room. Equipment was state of the arts at the time, 4-track reel-to-reel, great monitors, top of the line mics. Bob Shad was the A&R man (artist and repertoire), Frank Abbey was the engineer. We spent 12 hours in the studio, that was it, to make the entire LP. The original (and only) Jelly Bean Bandit LP on Mainstream Records Inc. 1968. The photographer was Chuck Stewart. He went on to become a famous photographer in the jazz world, doing pictures of people like John and Alice Coltrane, Eric Dolphy and others. It was a real mixed bag. Lead song was “Country Woman” which was an answer sort of to “Get Out Of My Life, Woman” by Lee Dorsey. He sang about the woman he didn’t want, and we sang about the one we did. “Generation” started out with Billy singing “Look To The Skies!” which was the opening line of a comedy song by Buchanan & Goodman in 1956 called “The Flying Saucer (Parts 1 and 2. )” The guitar riff in “Happiness Girl” was lifted from a Slicker lipstick commercial of the time. We thought it was too good to waste on promoting cosmetics. Our first time in a big time studio and we were in total awe. We were given playbacks of every tune and asked “does that sound alright to you?” To us it was radiant and we basked in the sun of the studio monitors. We changed nothing. What we did is what we did. Not at all. Our agent was working a circuit for cover bands. Our manager gave us no guidance whatsoever. It was like “you’ve got your record now go and do something.” Local Hudson Valley radio stations played our music and some local bands, much to our delight, played some of our songs. But that was it. It was easy to say that there were personality problems in the band, which there was or there was musical direction problems in the band which there was. Stepping back 50 years later, the biggest truth was we had no direction and ran out of money. Everything else was secondary. Joe, Jack and I went to a short-lived trio called The Wedge, Billy and Fred went into country music, and eventually Billy made an oldies band named Big Edsel his lifetime career. Jack gave up six-string guitar to pursue his real love, steel guitar. He went to Ireland with a country band, got married, eventually came back and his first gig was on Grand Ole Opry. Talk about starting at the top. Joe foraged forward with power rock bands like River Road and others. I played in a cover band named Diamondhead and eventually an original band named Neptunes Buffalo and cover band named Maco Station. After the country band, Fred got into songwriting. We reunited in 1992 to do a benefit for the Hudson Valley chapter of the Vietnam Vets of America, the first time we had all been on the stage in 24 years. Iker Spozio, a gifted artist who publishes a magazine out of Paris and did an interview with me, re-imagined our 1968 LP cover in his vision and we used it for our 2009 Christmas Card. Goldmine Magazine gave us a full page in their annual collectibles edition in 1997 and said we were pretty good and bootlegs of the LP started popping up all over the internet. I called everyone, said there’s something going on here and asked if they wanted to get back together and do some more recording. Billy was busy with his Big Edsel project so he bowed out. In 2001 we put out our first new recording of new material in over 3 decades, “Time and Again.” Then, to satisfy our nightclub fans, we put out the two live recordings from the 60s, “Mirror Music” and “Other Sides Of The Mirror.” One of the most unusual releases was “Bandit Planet” which featured our original recordings and cover versions from bands from different parts of the earth who were our fans. There was Romislokus from Moscow, The Secrets from Australia, Graceland Homegrown from Vienna and some from around the U.S. “Rock & Roll Is Keeping Me Alive” followed next. In 2012 we recorded “Rolling Thunder” which became the official song of Rolling Thunder XXV, held Memorial Day 2012, with over 1 million American vets in attendance. It was submitted for a Grammy. Joe had a hunting accident where he fell out of a tree and broke his back, which brought us to a halt. In 2004 Billy ended his Big Edsel band and wanted to come back with us on the next recording. We were delighted because Billy had the best voice in the band. Fate stepped in however and Billy had a fatal heart attack during surgery. At Rolling Thunder XXV, 2012, Washington DC. where our song, “Rolling Thunder,” was the official theme song Memorial Day weekend that saw over 1 million military veterans gather in Washington, D.C. 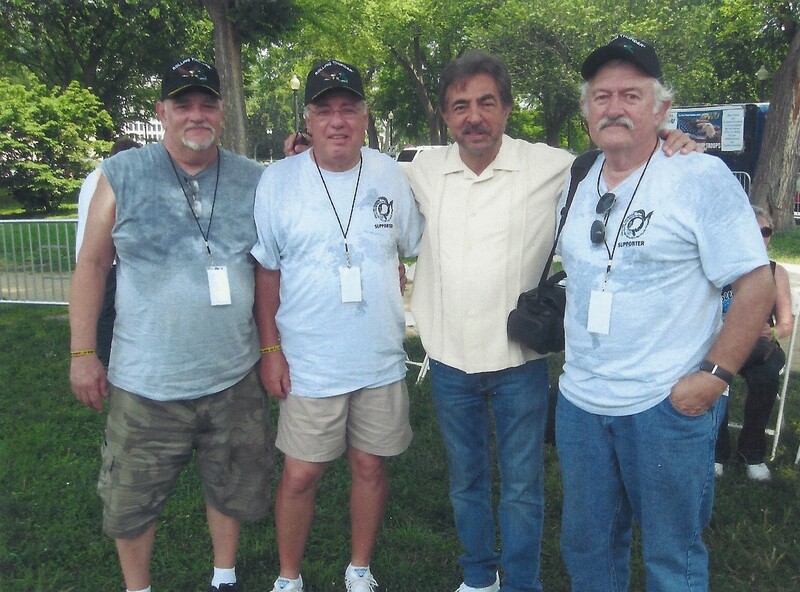 In the photo (left to right) Bandits bassist Fred Buck, Bandits guitarist Jack Dougherty, Joe Mantegna (from “Criminal Minds” television series) and Bandits keyboardist Mike Raab. 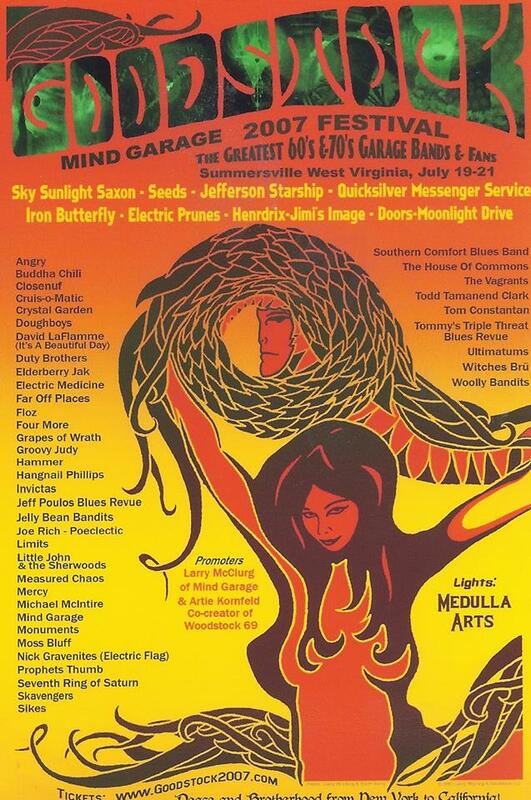 We almost reunited in 2007 for the proposed Goodstock Mind Garage Festival. Started off big like the poster shows. 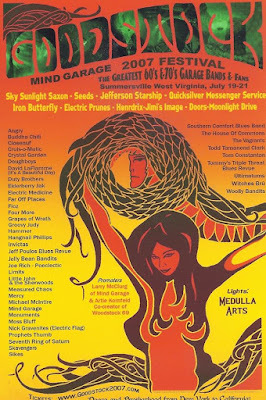 Headliners like the Jefferson Starship, Iron Butterfly, Electric Prunes and others, plus you’ll find us listed in small print. Little by little, updates showed fewer and fewer big names on the line-up and we knew the promoter was running out of money so it never happened. When we started recording once again, we sent out Christmas cards to our fans. This one is of Christmas 2004 with (left to right) Mike, Fred, Santa, Joe, Bill and Jack. Billy’s Big Edsel Band had come to a finish and he was eager to get back in the studio with us. We were looking forward to having the best voice in the band rejoin us but he had a gall bladder attack and during surgery had a fatal heart attack. The highlight of being in the band was our recording. It was rushed, it was crazy, it was impossible and it worked. “Generation” was the one song that two of us wrote – Billy the verse and me the chorus – that juxtaposed greaser lingo with a psychedelic chorus. Of the new Bandits recordings it had to be “Rolling Thunder”. Most memorable (of sorts!) was when we played at the Brown Derby, a nightclub in East Orange, New Jersey. That weekend we opened for Fats Domino, but one night during the week a biker club took over the bar, and they started yelling “Let Joe the Mystic onstage.” The stage was lit by old-fashioned flood lights. Joe came onstage, unscrewed one of the flood lights, wrapped it with his handkerchief, broke it and ate it. He even came up later for a second encore in which he had us take the razor blades from our razors in the dressing room and he ate them, too. That was memorable. The first CD we released in 2002 of live performance tapes made in 1967. It was released for the many people who knew us as a dynamic cover band. I used to tape our performances back then with one mic and that trusty reel-to-reel so we could review them and figure out how to improve our arrangements. Little did I know that 35 years later they would be made into something for sale. What are some of your favorite memories from The Jelly Bean Bandits and the 60s in general? Great memory was the first time a radio station played our recording. It was WHVW, a small 950 watt station in Hyde Park, New York. We were on our way there when they played a cut. We immediately pulled off the road, cranked the car radio as loud as we could and just let the music rush over us. Another time we did a day before Christmas lip synch on Hank Brown’s Twist-O-Rama TV show in Schenectady NY. Had never done anything like that before. Put on our Bandits outfits (the only other time we every dressed like our LP cover) and wandered around beating on a rubber chicken, for lack of something else to do. And when we walked into a local nightclub and heard another band playing one of our songs, we were torn between “that’s not the way that song goes” and “thank you, thank you, thank you for playing our music.” Of course the thank-yous instantly won out. Nehru shirts, paisley patterns, ah the mid-Sixties! Outside of the LP cover, this is the only studio shot we ever took. And, on the LP cover, Jack flipped the bird to the camera by accident. In this shot, we flip the bird to the camera on purpose. This was our last CD, recorded in 2007. We featured a fabulous guest guitarist (and good personal friend) Steve Horrell on 2 outstanding cuts, “Rock&Roll Is Keeping Me Alive” and “Lady In My Past.” Again, the music was all over the place. “Taylor’s Tale” was a tribute to the original “Planet of the Apes,” “If You Believe” was an affirmation of faith, “This Time The Floods” was about the destruction of New Orleans by Hurricane Katrina, “My Beret” was a homage to Fred’s favorite hat, “Ghosts Around The Piano” featured a tribute to great rock stars we had lost. The video for “Ghosts” can be seen at: Jelly Bean Bandits – “Ghosts Around The Piano” (2011). Good friend Duke Ladd plays the ghost. 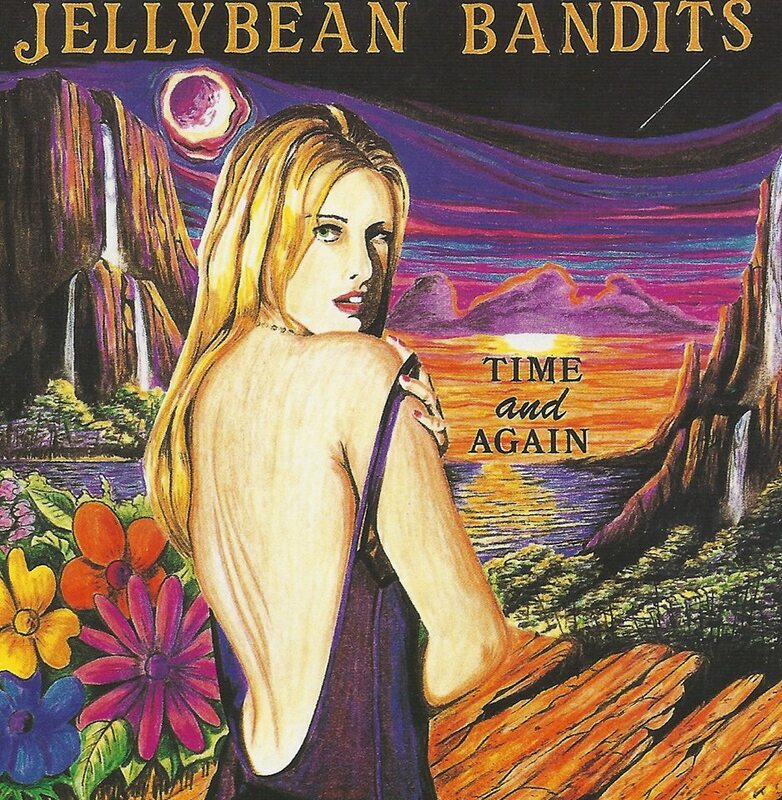 Is there any unreleased material by The Jelly Bean Bandits? No, we’ve mined it all, including the demos. Goodstock was another one of those great festivals that never happened. Our friends, The Secrets from Melbourne, Australia, suggested to the promoter to add us to the bill. We were thrilled to be on the same line-up as many of our rock and roll idols. But, like so many other great proposed events, the promoter ran out of money. Nice poster, though. 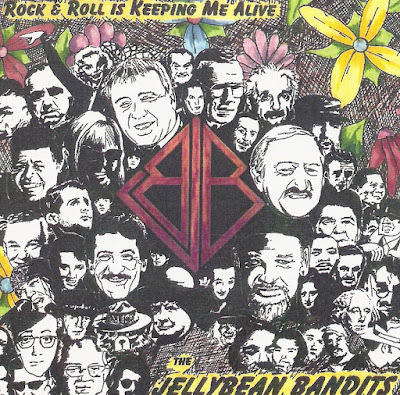 Eight recordings by The Jelly Bean Bandits, coupled with 8 covers by 8 different bands. From around the world, Romislokus from Russia, The Secrets from Australia, Graceland Homegrown from Austria, and from around the U.S. Hotrod from New York, Neptune’s Buffalo from North Carolina, Vanishing Point from Arizona and others. Incidentally, the covers for “Time and Again,” “Rock & Roll Is Keeping Me Alive” and “Bandit Planet” were are created by our bass player, Fred Buck. Classic rock recordings include “Sgt. Pepper,” “The Best of The Guess Who,” and the Woodstock soundtrack. This century faves include Kid Rock “Rock&Roll Jesus” and “Born Free,” and Lenny Kravitz “Strut” and “It’s Time For A Love Revolution”. Both are current rockers who approach much of their music with an ear out of the Woodstock era. Some Foo Fighters and some Metallica as well. We really have no idea why our LP from 1968 has continued to gather new listeners but to all of you who have discovered and streamed our songs, a major “Thank you!” And a second “Thank you!” to It’s Psychedelic Baby Magazine for putting us back in the spotlight. Thanks for doing and sharing this interview, it's nice to discover another band from those halcyon days and Michael's good humor made the interview quite a delight. Great interview! We met Michael Raab this past weekend in Raleigh NC, as he had a short film screened(Longleaf Film Festival) on the same billing/block as my gal pal. We chatted with Michael after the Q&A, when he referenced another film project, about Muscle Shoals. I lit up like an Xmas Tree. During our chat, of course, I had to ask if he was a musician, and learned he was a member of the Jelly Bean Bandits. That opened up a great conversation ,unfortunately too short as we had to head back to the next block of films. If you see this Michael Raab, it was an honor to meet you and listen to some stories of your days with the Jelly Bean Bandits, current and new film projects. Hope to have an opportunity to catch up with you in the future. We're in Durham NC not to far from Wilmington. Cheers .